Well here it is I finally got over my fears and finished this thing, with a bit of help from a friend. So if anyone who reads this is lives in the Southern California area namely San Juan Capistrano, San Clamente area and need a great employee just give me a call. PROFILE – I am honest, principled, positive, team oriented and a quick learner. I passionately pursue my goals. I enjoy working hard, and paying attention to the details. I take pride in my variety of experiences because it has made me a more valuable person to the marketplace. I can build rapport with clients, customers and co-workers to create synergy towards a common goal. I communicate effectively. I manage my time and responsibilities to be an effective member of any team. I received 5 promotions in less than a year with the company. I handled the direct sale of Cutco Cutlery to the consumer from initial contact, to closing the sale, to follow up and future service. I was #3 in my office out of over 400 representatives in my tenure. Every single demonstration I set was solely through leads generated by myself. Hughies is company that provides sound equipment and computer set ups for business meetings, retreats, high school reunion and a variety of charities. I set up audio carts, projector carts and screens. I also interfaced with Clients to make sure they were happy with their set ups and to make sure everything ran smoothly. That involved troubleshooting with laptops and projectors and sound equipment. I assistant Coached at my former High School. I have enjoyed working with the High School girls, teaching them basketball skill and how to be successful women of God. I was the Expiditor for a Construction Company that built custom homes. I checked on sub contractors and made sure they had the information and supplies they needed. I interfaced daily with customers and sub contractors in planning and troubleshooting the building project. I stained and painted siding, doors and trim. I made progress videos for out of state clients. I also viedeoed and photographed all our finished projects and made promotional videos. I was put in charge of most Computer management of Silver Wolf Inc. I was in charge of all computers in the business and was the in- house tech support. I handled all new software installation and management along with backup of company files and smart phones. I ran sound equipment at my youth group for a full band along with dual screen PowerPoint, and Media Shout presentations for our main Sunday and Wednesday services. I also am familiar with the Microsoft Suite including Powerpoint, Word, Excel, Moviemaker and Publisher. I am comfortable with both PC and Macs. I pick up on things quickly and work hard to get the task at hand done. In my years working for Silver Wolf Inc. I increased my value as an employee by learning new skills and perfecting already existing talents. Some days the only thing that pulls me from my fluffy warm bed is the belief that if I do not I will be punished, either with lose of wage or explaining why I was not at work or whatever was on the agenda that day. But really with that mentality it is no wonder I find my daily life unfulfilling. That way of thinking falls in the same category as “playing basketball to not lose, instead of playing to win.” I have alway wanted my life to be a section in History that people loved to read that they would wonder what I would have accomplish if I had lived longer. That is not the story I am currently writing each morning when I wake up. I have so many reason to get out of bed each morning and to stay up late each night. And yet I forget them. I forget how peaceful a sunrise is, I forget how comforting the feel of a keyboard is beneath my fingers and how nature a pen is in my hand. I forget the smell of cut lumber and the feel of a loving hug. I forget the warmth of a familiar and friendly voice. The darkness and seclusion of night dulls our senses and out memories. We slip away to far some nights and forget all that daylight gives. I am so excited to live in California where the sunshines far more than it does in Montana. I have found a new addiction in the sun and the sea. I am on my way, please wait for me I will be there soon. As I am preparing for my move I am endeavoring to tighten up my resume and have sent it to a couple of friends for review and now the fun part comes reformatting and rewriting it. I don’t really know why but this process is creating a lot of anxiousness and fear in me. For someone who loves words and loves to write you would think this would be an easy task but right now I feel very inadequate to the task so much so that I am avoiding it by blogging about how I am avoiding it. I think part of what is going on is that whole mistakes/perfectionism thing. I feel like if I don’t make the perfect resume I will not be able to get a job and If I can’t get a job in California I won’t be able to rent a place to live and if I can’t find somewhere to live I will have failed and my life will end in my pitiable death. Little intense I know but honestly that is the pressure that I am feeling over this thing. Its really freaking me out. To a point of not being able to face it. This process is bring up a lot of my fear that I have buried pretty deep and to continue with my plan of moving I have to face them and today I just don’t know if I have what it takes to do that. Its a little pitiful to be sitting here afraid to write a resume but thats where I am at. If my first step goes wrong then I will never get back on track again. I know I am capable of doing this but really its not about the resume this is about my our fear of failing my dreams. I am making a promise to myself and all you who read this that when I have finished my Resume I will post it here on this blog. It has almost ten years since I visited Arlington Cemetery and on this day most of all I remember back to it. It is almost breath taking and also heart wrenching to see all those white headstones, row upon row, upon row of the lives that have been given for mine. As I sit here recalling how it felt to walk around in that place the emotion wash over me again. The sorrow was the first thing to take hold of me, all those men and women who will never return to there loved ones, who will never kiss there lovers, who will never see their children, and for what, they died and sacrificed all they had for me, for a country that argues about the value of their sacrifice and the meaning of their death. I would say to you that their life and their death are far more meaningful than any other that I have know. Politics and worldview do not have the power to touch or taint their sacrifice. I did not feel joy to see those white headstones but I did in time feel honor and courage wash over me. I was honored to be a part, a member of a nation that understands that my individual life is mine and I am free to live as I choose and that there are people all around me who value other more than themselves so much that they will leave the comforts of their home and give there lives for people they will never meet. I am proud to be an american not because of what I have or what I have do, but because my nation understands the power of love and sacrifice. I will not abide people who speak ill of the military, they are far nobler than anyone I have meet. They freely choose to go into harms way for me. 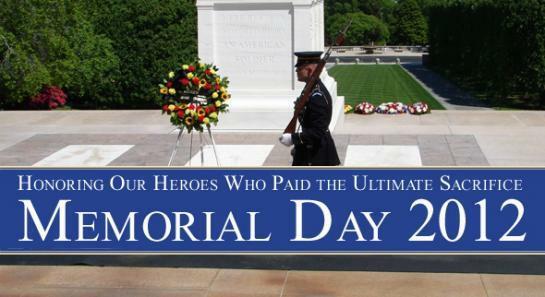 I have had a peaceful and protected life because of the men and women who lay dead in Cemeteries around this country and I will not forget what they have done for me and I will be the first to stand and honor there actions. I was talking with so an older lady at work this last week about the “evil” of facebook and text messaging and she made an interesting point, it may have been a little farfetched but it struck a cord with me. She said, “Young people are going to forget how to hug” I am not sure about you but I have quite a few friends that the only way I interact with them is thru social media, facebook, texting, email and talking on the phone, which I am not saying should be outlawed or stopped. I am so grateful that there are ways I can stay in touch with them. I heard this quote a while back and it came to mind again while I was talking with my coworker. “We need 4 hug a day for survival. We need 8 hugs a day for maintenance. We need 12 hugs a day for growth.” I personally know the power of touch, I have been called a ‘warm fuzzy’ person and also a ‘huggy person’; my friends all know that I am always available for a hug all they need to do is ask or just spread there arms and I will welcome them with open arms as well. Hugs are so powerful, there is great power in a positive and affirming touch. I was thinking about my daily life and how often I actually receive hugs and how often I give them. There are friends that I have spent hours on the phone with as they walk thru hard times and all I could do was listen but truly deeply in my heart I knew what they need was not for me to say ‘I’m sorry’ or ‘I love you’ they need a hug. That is the one thing that technology never will be able to do for us, that is purely human ability and one that I wish we as a culture did better. I have begun to worry that our attempts at staying connected over social media and using technology is creating people who need even more desperately a human touch. A text message or phone call can change the whole mood of someone’s day but never forget the power of going to a friends house just to give them a hug. Hugs don’t just change your day they can heal your soul. So today I started going thought all my stuffed animals, it’s a little overwhelming making decision about things that are so sentimental to me. But I am also very proud of myself I went from 4 large black garbage bags and an very big box to 2 boxes of keeps and one overfull box to sell or give away. 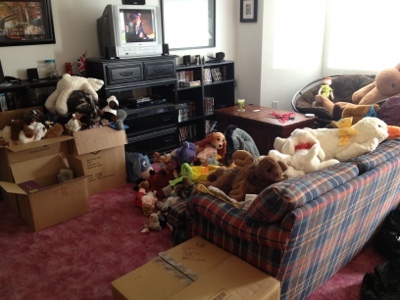 Here is a picture of almost all the stuffed animals I had.